The newest luxury rental home project at Santana Row is just about ready. Phase 1 consists of 212 homes which will range from 456 SQFT studios (a first for Santana Row) all the way up to 2,780 SQFT penthouse suites. 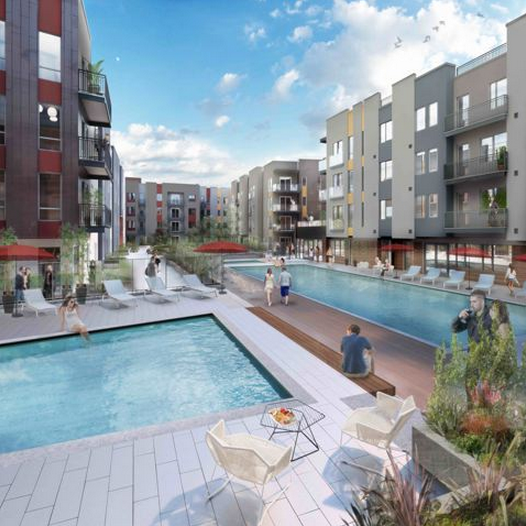 There will be high-end outdoor amenities like a 75-foot lap pool, Baja pool, sun lounge, spa, outdoor BBA, al fresco dining, a roof-level pet park, and landscaped gardens. Indoor, they will have a wine cellar with lockers, billiard and gaming tables, a fitness studio, a serenity lunge, a private cinema, cafe, conference center, and a concierge. Construction began in Feb 2012, pre-leasing happens later this month, and move-ins should start in October. Misora is overall a good place, IF ONLY the concierge is NOT VERY RUDE. Aaron Menchaca, one of the concierge, is very disrespectful! He shout to people instead of talking nicely. I think he has an attitude problem. He cannot talk to people nicely. I am ending my lease here soon. You better check back on whether he is still working or not if you want to decide to live in Misora. All the other concierge are okay, but he ruined the standard with his uneducated behavior.